Our work on strain tuning of quantum photonic circuits was highlighted in Nature Nanotechnology 14, 4 (2019) " Strain stretches photons " and Nature Photonics 13, 72 (2019) " Strain-tunable dots "
Adapted from Nano Lett.18, 12, 7969-7976 (2018), the figure shows SEM image of a nanowire QD coupled to a SiN waveguide fabricated on a piezoelectric crystal. Strain is used to modify the QD emission properties and reconfigure the photonic circuit. Congratulations to Prof. Val Zwiller for receiving project grant from the Swedish Research Council for his project "Kvant Ljus Detektorer". Congratulations to Dr. Klaus Jöns for receiving the starting grant from the Swedish Research Council for his project "hybridteknologibaserade kvantrepeterare". 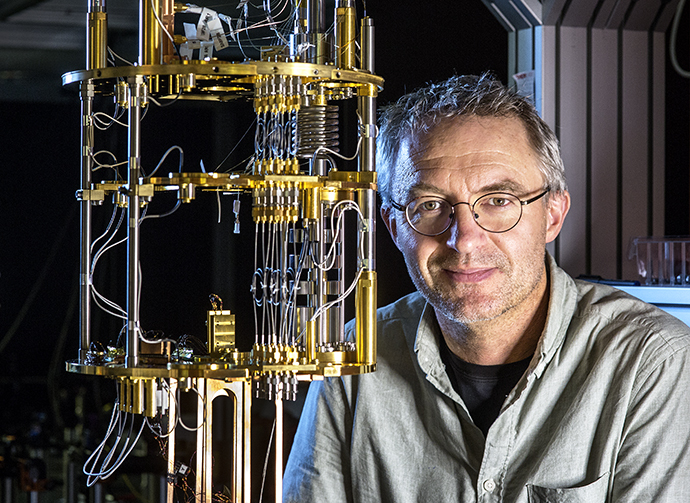 Congratulations to Dr. Klaus Jöns for coordinating S2QUIP project as a part of the European Quantum Flagship. 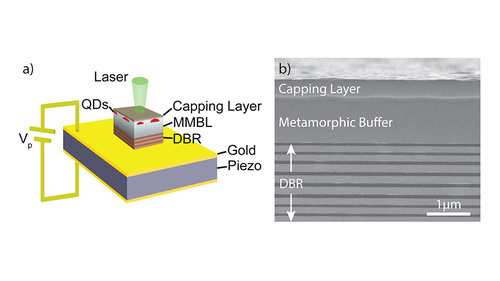 S2QUIP will develop scalable cost-effective quantum photonic hybrid microsystems by integrating 2D semiconductor materials in CMOS compatible photonic circuits. S2QUIP will provide the community with on-chip quantum light sources for quantum simulation, communication, metrology and sensing. In total, 20 projects have been selected out of 140 submitted proposals for the ramp-up phase of the initiative, more information can be found here . The Royal Swedish Academy of Sciences granted the Physics 2018 scholarship to Dr. Klaus Jöns. Adapted from APL, 112, 173102 (2018), the figure shows schematic and SEM image of wavelength-tunable single-photon source at Telecom wavelength. Congratulations to Prof. Val zwiller for receiving the Wallenberg foundation grant as the principal invistigator for “Quantum sensors” project. Congratulations to Prof. Val Zwiller for receiving the 2017 Göran Gustafssonprisen. 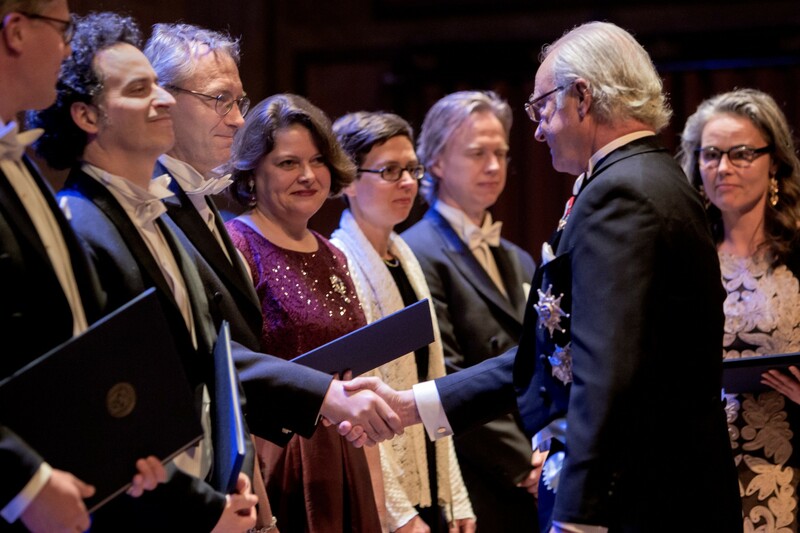 Göran Gustafsson Prize is a national Swedish prize for outstanding scientific achievement awarded annually by the Royal Swedish Academy of Sciences in Chemistry, Mathematics, Medicine, Molecular Biology and Physics [ source ]. We organized a public lecture about using light for optical communication and imaging as a part of the "Week of light" event at the Dome of Visions . We showed live demonstration of free-space laser communication channel. Read full story! Congratulations to Dr. Ali Elshaari for receiving the 2016 Marie Skłodowska-Curie Individual Fellowship. 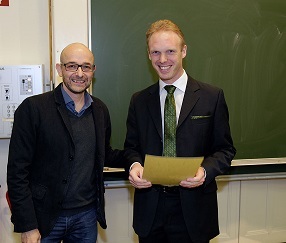 Marijn Versteegh received the Ehrenfest Best Paper Award for the best publication on the foundations of quantum mechanics of the year 2015. 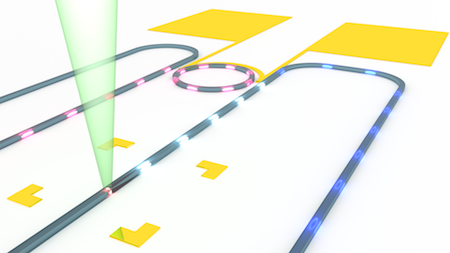 The prize was given to the authors of the article 'Significant-loophole-free test of Bell’s theorem with entangled photons', PRL 115, 250401 (2015). This article is about the Bell experiment that Marijn had performed, together with Marissa Giustina and Sören Wengerowsky, in a team led by Anton Zeilinger at IQOQI, Vienna. Other prize winners were the group of Sae Woon Nam at NIST, Boulder and the group of Ronald Hanson at TU Delft. The award ceremony was held in Vienna on December 2, 2016. At this occasion Marijn gave a talk about the performed Bell test. Congratulations to Dr. Marijn Versteegh for receiving the starting grant from the Swedish Research Council for his project "Excitonic superfluids with quantum vortices". Congratulations to Dr. Ali Elshaari for receiving the starting grant from the Swedish Research Council for his project "Quantum Transceivers".